for you before the sausage is smoked. All prices listed below are by the pound. 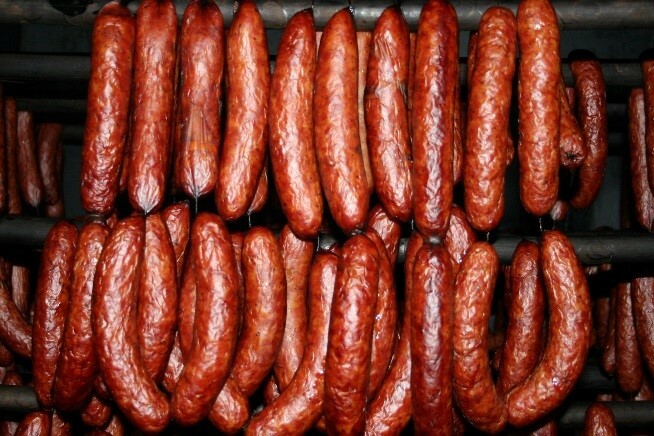 There will be a 10-13% loss for the finished smoked sausage due to the smoking process. When cooking smoked sausage make sure it is heated all the way through. It is 85-90% cooked already but not fully cooked. If you are making ground meat and add anything other than beef fat (chuck, brisket, pork, bacon)that will be at market price and subject to change. an EXTRA charge of $5.00 per day. make a better product. We use lean pork shoulders.